Mama is the feature film debut for director Andres Muschietti who has big name director and horror fan Guilmero Del Torro (Pans Labyrinth) as his executive producer on the project. The films story follows two young girls (Megan Charpentier and Isabelle Nelisse) who are left stranded in the forest after their fathers post financial crisis psychotic breakdown in 2008. Five years later, the girls are found in the cabin by passing hunters and returned to the custody of their Uncle (Nikolaj Coster) and his girlfriend (Jessica Chastain). It is not long before the audience finds out that the girls did not come back from the woods alone. Mama was shot for a very modest budget of $15 million. With a low budget film still achieving the number #1 opening weekend slot and a domestic gross of nearly $80 million, you can almost guarantee the will be more films of this type on the way. While it can be great to see a good story have continual development, in Mama’s case it would be better if this stayed as a singular title. The film is ended neatly but perhaps not the way people may think. 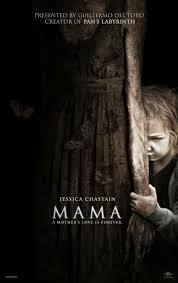 Throughout the film Mama actually has some things to separate it from other horror films of the genre. General lack of gore and more of a directorial push towards suspense is a refreshing change from the feeble-minded slasher remakes that are slicing through the cinema of late. The special effects are second to the story and the cinematography is dark and looks fantastic in widescreen. Mama is not totally devoid of clichés and hiccups though either. Chastain is straight away unbelievable as a punk rocking base player. Editing at times is a little over the top. Upon returning from the forest to civilization, the girls are edited to move like quick feral creatures. As much as this can be effective, it can also distract from the type of realism that this film tries to achieve. Dream sequences and a slightly crammed second half add to some viewer confusion. These are minor grievances for a film that is still directed with strong intention and above average horror filmmaking flare. Fans of Del Torro will see why he is backing this film and will get something out of it. Defiantly standing above other films of this genre we have seen recently, horror fans should also get along to the cinema to check it out. Mama would have benefited from more genuine scares and less editing to try and trick us into being frightened. What is on display though is at times chilling and very well made for a feature debut. Not afraid to be different in its approach, the film also ticks many boxes horror fans are ready to scrutinize films for. Those that like a little fright with their popcorn should get along to watch it before Hollywood does a Mama/Saw crossover film starring Tara Reid and Martin Lawrence.